it will sing a fun sing-a-long tune, flap, and light up its wings. The music and bright colors are fun and appealing, but the toy also comes with five different buttons. a melody button, a button that allows the duck to talk, and a heart button that make a warm heart thumping sound. The duck also has a little baby duckling that, if pushed it will quack like a duckling and light up it mom’s wings. All of these sounds are fun to hear and sing with, but in case a silent environment is needed, the sound can be adjusted to mute, low, or regular. We purchase our products directly from the manufacturer, so you know you’re getting the best prices available. NEW PRODUCT WITH FACTORY PACKAGING. This is such a cute toy duck!Add to your card for your babies NOW! 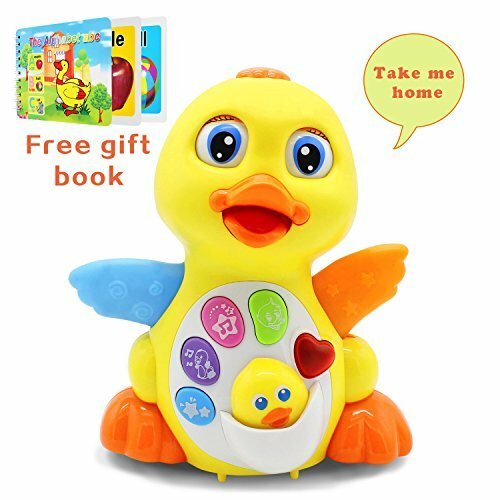 Vibrant Colors, songs, and dancing all preinstalled,Express your love with this musical yellow flapping duck. Make play time a fun time! The duck sings fun and happy tunes while flapping and lighting up its wings. the child will enjoy dancing and moving with the universal moving function installed in the duck.